Hello and welcome to your next stop on DeNami Design's "Bright Blossoms" Blog Hop! If you're on track, you've arrived here from Stacy M's super creative blog. If not...no worries...you can pop on over to the DeNami Design Blog to start at the beginning. I LOVE the theme for this month's hop! It's so happy and summery! For my creation, I decided to pull out one of my FAVORITE DeNami Design blooms, the E150 Water Lily. I stamped the water lily three times (once directly onto the doily die-cut and then two more times on scrap pieces of white cardstock). I added color with markers and then cut out the individual pieces and stacked them with foam dots to add dimension. I also added a touch of sparkle with a glitter pen. What do you think?!?! Be sure to leave a comment on this post and on each participant's blog throughout the hop for a chance to win a FABULOUS prize from DeNami Design! Comments must be received by June 9, 2014 at 11:59PM PST. GOOD LUCK! Next stop: Donna Bowman. I can't wait to see what she's created! Stunning! Love the vibrant orange Water Lily! Great colors to pair with the aqua~ Also love the patterned paper too! Plain and simple but so very pretty. I like the color combinations, Thanks for sharing! Lisa, I love the simplicity of your card! It is so striking! My favorite color combo. Your orange water-lily POPS off the card, Lisa! Love the doily as an element in the card. Making the flower pop wonderful. Very pretty colors and I like the dimension and sparkle. Pretty CAS card, Lisa! Very nice for summer. This is so pretty. It just feels like summer! Love that stamp! Beautiful card, perfect papers, colors and elements. Very pretty with the clean design and the wonderful colour combo. Fabulous color work on that water lily. Love how it really pops on the card. Nice work. beautiful water lily stamp on your pretty card! Great colors! I love that water lily! Your card is simply gorgeous. Love your sweet card, Lisa! Thinking I may need that water lily! 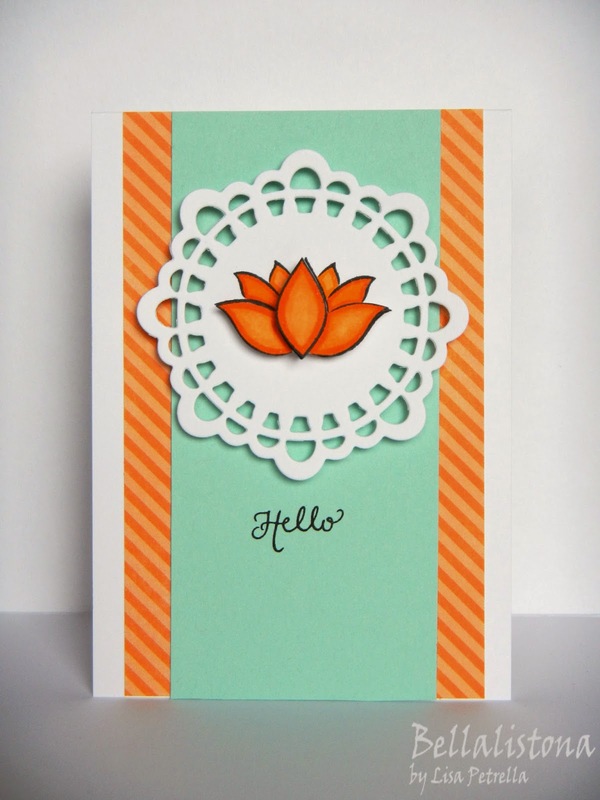 I love the orange color of the water lily and the design of the card. It is very pretty! Thats a very cute color combination. The flower stands out and shines! Love it!! The bright orange colour draws the attention to your great card ! I love this simple card. Orange is one of my new favourites! I love that lily inside of the doily-like die! Very beautiful! Oh! My favorite water lily too! And this shows it off so well! Bright, sweet and just plain pretty! Lisa this is adorable. Thank you also for the supply list as this is going on my "to order" list! You are able to take the simplest design (water lily) and create such an elegant card. Thank you for sharing such wonderful talent with us.